We’ve had some REALLY pretty skies the last couple of days, and I’ve been taking photos. Not feeling otherwise inspired today — and having the aforementioned lovely sky photos — I decided I’d do Sky Watch Friday. 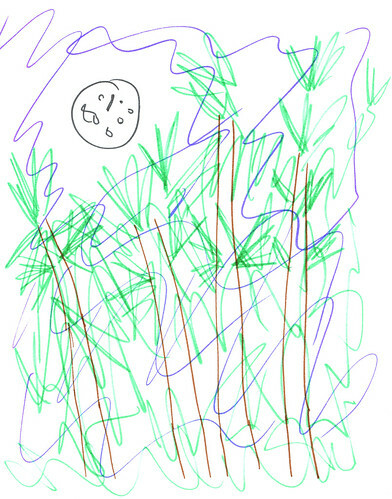 If you’re not good with childlike drawings (or perhaps even if you are), that’s the moon as seen through the pine trees. And, no, the moon isn’t full in real life. But I’m not so good at drawing full moons, much less trying to draw a waxing gibbous (bigger than 50 percent toward full) moon, so it’s full for the purpose of this post. Gotta love being an artiste! 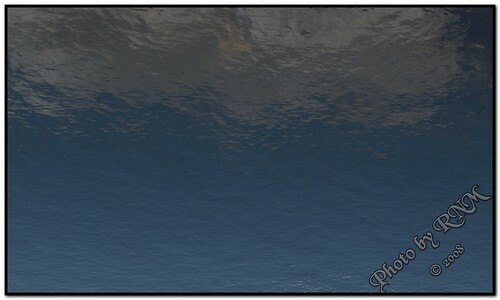 This entry was posted in Ramblings, Sky Watch Friday on October 9, 2008 by ramblingsbyreba. 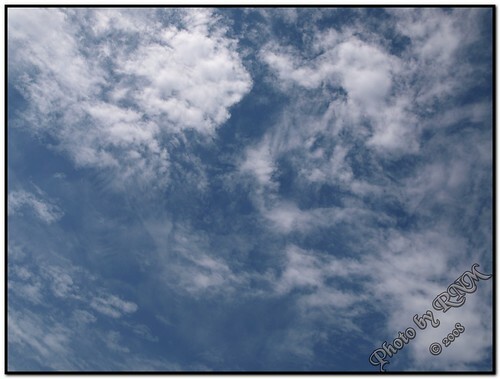 This entry was posted in Photography, Sky Watch Friday on September 4, 2008 by ramblingsbyreba. I took this photo at 6:10 Wednesday evening. When I went into Curves about 30 minutes earlier, the sky was filled with HUGE puffy, dark clouds like the ones at the bottom of the photo. The new Sky Watch Friday Mister Linky will be posted at 3:30 p.m. eastern Thursday afternoon. Or is it 2:30 p.m. eastern? Or 4:30 p.m. eastern? (I’m SO bad at figuring out what time it is where I am compared to 7:30 p.m. GMT.) Whatever time the new Mister Linky is put up, I hope you’ll join the fun. 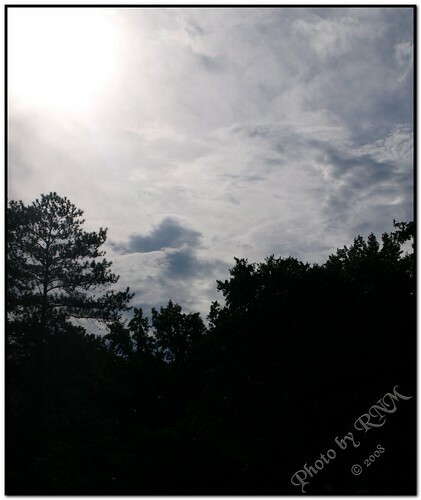 This entry was posted in Photography, Sky Watch Friday on August 28, 2008 by ramblingsbyreba. 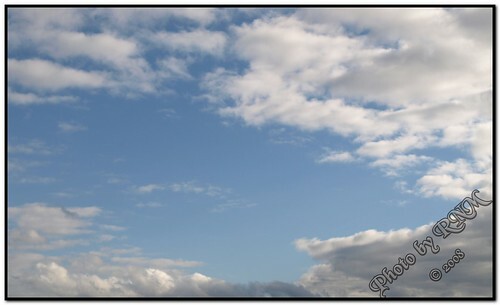 This entry was posted in Photography, Sky Watch Friday on August 14, 2008 by ramblingsbyreba. 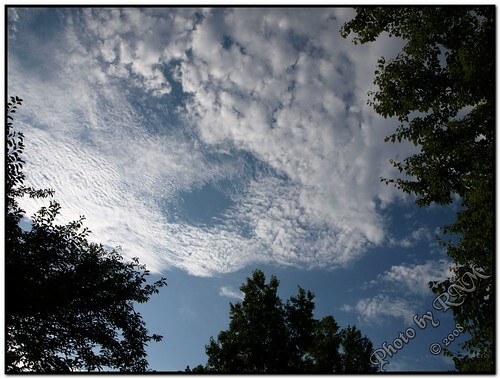 This entry was posted in Photography, Sky Watch Friday on August 7, 2008 by ramblingsbyreba. This entry was posted in Photography, Sky Watch Friday on July 31, 2008 by ramblingsbyreba. Actually, I’ve been meaning to do Skywatch Friday for awhile, and I decided to strike while the iron was hot. I got started with this tonight, because I wanted to remove the power lines in the original, which is here. I’m glad I figured out something decent… because the original file is gone. I forgot to make a copy of it when I started cloning. OOPS! For more Skywatch Friday posts, click here. 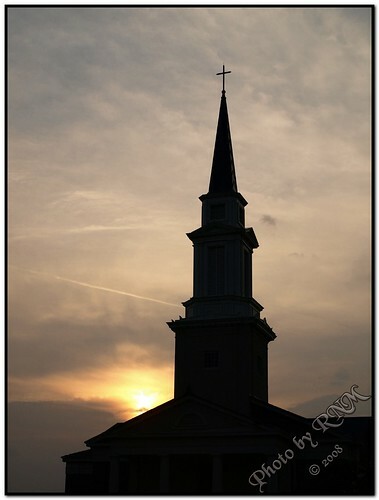 This entry was posted in Photography, Sky Watch Friday on July 24, 2008 by ramblingsbyreba.